Thanks to Megan for sharing this picture from her store in Australia. 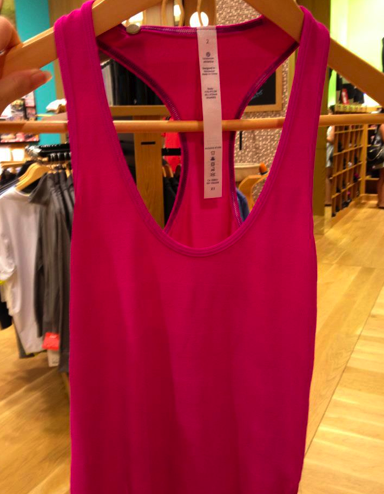 This is a Paris Pink Cool Racerback with embossed ribbed stripes. "Real Photos Of: Run: Switch Back 1/2 Zip and Get Fit Tank"
"Run: Back On Track Tank, Get Fit Tank, Run: Switchback Pullover, Run: Tracker Short II and Turbo Shorts"